“The Australian Outback is effortlessly crazily beautiful.” - SILVER PEERS...USE IT or LOSE IT! Astronaut Chris Hadfield is famous for his zero gravity Major Tom impression He flew his first mission in space in 1995 and became the commander of the International Space Station in March 2013. It looks to me like a very lovely PAINTING. I have been to the outback, and it didn't look as good as that. I was struck by the absence of trees, and the roads where you can see miles ahead. That's the memory I have of it. I wonder where that is? The outback,from the ground,can be very boring,but at other times it is quite wonderful. It is particularly,breathtakingly spectacular,at night,laying back on a recliner,watching the night sky. It is almost like being in space,yourself. I'm guessing that is a high altitude view of the oldest rocks in Australia - the shield rocks of Western Australia. 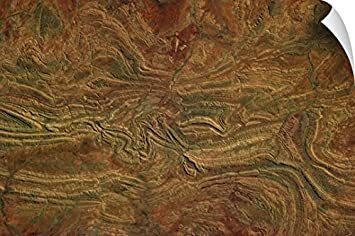 I love looking down from a plane at the braided river systems of northern/central Australia. They are fascinating. but the way I read it the colourful one is the photo.